I feel very strongly that there’s something wrong with the social media industry if those who are supposedly building it don’t even bother to make an effort, to step up and to do something new and scary, how can they expect the rest of the world to join in? SocialInnovationCamp sounds like a great event: developers and designers are brought together with people with a great idea to make a prototype over one weekend. A couple of previous prototypes were presented and showed how that weekend was the start of actual viable websites. The next SICamp will be held in Glasgow on the 19 of June, and you can submit your ideas for a prototype until the 22nd of May. Vero held a nice discussion session about the do’s and don’ts for marketing agents when contacting bloggers. The attendees of that session were a nice mix of bloggers and marketing people. Cake! To be specific: Broken Biscuit Cake. 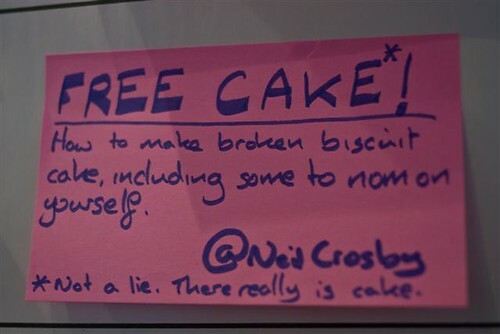 Neil Crosby had a fun session on how he made this cake and let us all sample it. The recipe is also on Neil’s blog and I know I’m going to give it a try some time: the cake was delicious! This was a great talk from Joanna Geary about how she met her troll in real life. While working for The Birmingham Post, she came across a regular commenter, “Clifford”, who was very criticizing about The Post. After a while she wanted to meet him in real life and see what type of person leaves those type of comments. Turned out in real life, he was a very polite and nice old man; and he was oblivious to the image he had online. Read more about Clifford on Joanna’s blog. Surprisingly I found this one of the most interesting talks of the day. Max (hawkida on Twitter) gave an introduction to LARPing, how she got involved into it herself and the rules and ideas behind it. It’s much more complex than I had imagined it to be; it’s like a real life Dungeons & Dragons session where you have to memorize every single move and statistic of your character. I don’t think it’s something for me (the whole camping thing is not my style), but I’d love to try it out at least once in my life. After all the sessions there were some free drinks and some prize draws. I won a weird PC game called Chuzzle. I still had some energy left, so I decided to join the Photo Scavenger Hunt organized by Kat. It was great fun, but more about that in a later post.